Panicum commonsianum Autumn form. (Dichanthelium ovale var. addisonii). Gary P. Fleming. Digital © 2014 Virginia Botanical Associates.vaplantatlas.org (Accessed 5/2014). Dichanthelium ovale var. 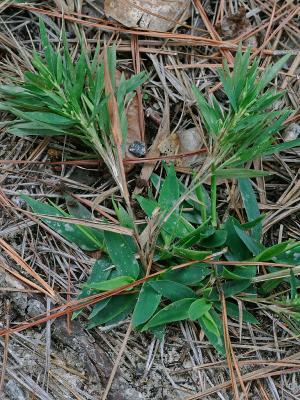 addisonii is a perennial grass, tufted, gray-green, sometimes purplish, basal leaves in an over-wintering rosette; vernal plants erect, stiff, 10-60 cm, some sheaths and internodes hairy with both long (to 0.2 cm) and short hairs; sheaths finely ribbed, shorter than internodes, ligule a band of short hairs in front of a band of long hairs (to 0.5 cm). Leaves linear to lance-shaped, 4-9 cm long, 0.3-0.7 cm wide, base rounded to slightly lobed with margins minutely toothed, often hairy below with hairs of 2 lengths, margin inrolled; late season leaves not much reduced. Flower spikelets hairy, about 0.1-0.2 cm, few, often purplish; blooms May-July; inflorescence extended well beyond uppermost leaf sheath, broad, 3-8 cm long, and about as wide, stiffly spreading branches; late season plants prostrate or widely spreading, branched mostly from middle nodes, panicles much smaller, shorter than leaves; July-Nov.
Habitat: Open areas on sandy soil. Notes: Seeds of Panicum spp. eaten by many birds, foliage eaten by Muskrats and rabbits.